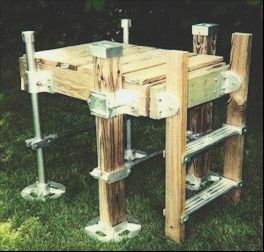 Order Dock & Ladder parts and build your own or purchase completely assembled. We offer the most complete, safe and effective line of cast aluminum dock, deck and ladder hardware online. All kinds of parts for your docks, floats or ladders are listed with pictures in our easy to use shop catalog. Shop online - save tax - it's easy. Made in the USA - Aluminum castings are made from a marine grade alloy with a tensile strength of 35,000 pounds per square inch. Buy now online in our secure shop. We ship factory direct to your door. Buy Dock Ladders or Dock Parts now! Order Parts to build your own or buy them completely assembled. Corrosion resistance is suitable for either fresh or salt water applications. For 2 X 4 construction we have the above outer wrap steps and we also have inside mounted steps (see shop listings). For Pipe construction we have the above pipe through steps. See more parts in our shop. See detailed info on "How to Build Your Own Ladders"